"It's a little bit... hard to believe, in a certain way," said Dr. Victor Zordan. "But I've done it myself - I've submitted myself to this process. It's... kind of crazy." Fully aware that his research straddles the line between the groundbreaking and the fantastical, Dr. Zordan was hesitant to speak too enthusiastically about the work that he and his colleague, Dr. Aaron Seitz, are pursuing. "So are we saying that, for people who are partially hearing- or vision-impaired, these methods could restore some eyesight or hearing?" I asked. A neuroscientist, Dr. Aaron Seitz is an expert in neuroplasticity - the sense that the brain is much more flexible and changeable than we've believed for centuries, as Dr. Zordan described it. Together, the two are furthering research into developing video games that effectively reprogram a player's brain to think, see, and hear better. "It's a little bit... hard to believe." "The cognitive testing that has gone on in his field has shown that we can essentially manipulate the brain in directions that we would like," said Dr. Zordan, an expert in computer science and engineering. He and Dr. Seitz are currently mid-stream in their research, with some "interesting" initial findings and a beta version of a memory-training game, which they plan to release to the general public. The concept of memory-training may not sound novel to you, but we're not talking about learning new techniques to help improve your memory - we're talking about neural reprogramming. "That's where it gets interesting," said Dr. Zordan. "The brain function actually changes. You don't necessarily develop a new strategy for remembering things - your neural connections are reconfigured." Memory is just one example, but this concept can extend to problem solving, hearing, and sight. 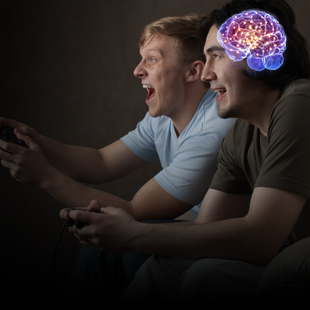 Deliberate neural reprogramming through video game playing is what Dr. Zordan and Dr. Seitz are pursuing - they are designing games that elicit improvement within the brain. Sounds too good to be true? Buckle up; they have results. "The brain function actually changes. You don't necessarily develop a new strategy for remembering things - your neural connections are reconfigured." Before their partnership, Dr. Seitz worked on a vision-training system that he tested with the UCR baseball team. According to the team's statistics, that system gave the team an additional four-to-five wins over the course of the season, the team had fewer strikeouts, the players scored better on eye charts, and the players themselves reported having better vision, all relative to a control group. How can this be possible? Many of us have heard that playing certain video games - such as First Person Shooters - can help train peripheral vision. But actually seeing better? What's important to keep in mind is that vision is a coupling of the optics and the brain, Dr. Zordan explained. The eye - the physical organ - collects information, and the brain then processes that information. The vision training program does not affect the eye itself, but the optical processing done by the brain. In other words, "it's really just optimizing the way that the brain uses the information that's coming through the eye."